Home / Posts tagged "Teaching"
As the introduction to Fifty Ways to Promote Teaching and Learning states, “In 1999, The Journal of Legal Education published an important article for law schools seeking to improve the quality and quantity of faculty scholarship output, James Lindgren’s Fifty Ways to Promote Scholarship.” Lindgren’s article reports that at least one law school saw improvement in scholarly output after implementing some of these ideas. The current article reviewed here, addresses the other side of a professor’s job, teaching. It provides fifty ways to promote teaching and learning in your law school. The authors make clear that not all schools will find all the suggestions useful, but implementing some of the ideas should help schools promote good teaching and learning, and creating a culture of teaching and learning. The article is filled with great ideas from administrative and financial support for teaching sabbaticals to requiring learning objectives in every course. “The core idea is creating a culture of learning about teaching and continuous improvement of all faculty members as teachers.” At its core, this article encourages deans and faculty to discuss teaching and learning, adopt some of the ideas, and track the schools progress. As a side note, our faculty had a round table discussion about the ideas in the article. The article was circulated to all of our faculty at Gonzaga. This article was published in The Journal of Legal Education, Volume 67, Number 3 (Spring 2018). Usually about this time in June—during the early-to-middle weeks of the summer break—is when I do an assessment of my teaching from the past academic year. By now, all of my final exams have been scored for a while and grades have been submitted. Students are gone off for their summer jobs and internships. A sense of quiet resides within the faculty hallways and invites contemplation. For me, it’s a great time look back because the distance from finals grading has dissipated any visceral feelings—positive or negative—that might have otherwise influenced a look-back at my teaching. I want any assessment to be as honest and objective as possible. In looking back this particular year, I note the presence of a few more non-traditional, older law students in my first-year courses than usual. Because of their increased presence, the challenge of trying to support them was thrust upon me from fall to spring. Of late, I have seen many great pieces in current law teaching literature focused on teaching law students from the millennial generation. However, when curiosity got the best of me and I searched for current articles on teaching and supporting law students outside of the millennial generation, I found some statistical knowledge, but not very much constructive observations or information. For those likeminded folks who have also wondered how to better teach and support our older, non-millennial law students, I have a few observations from my own experiences this year. Non-millennial law students are not a homogeneous group. Just because they are beyond the current mainstream generation of law students in age, does not mean that they resemble each other either. Many of my non-millennial law students varied in age and background from each other as well. As a reflection of that variation, they brought to the student body many differences in socio-economic status, career backgrounds and goals, and life experiences. For me, as the instructor, this variation also meant trying to use different strategies to make them feel included in the dialogue in the classroom—often relying on their practical experiences before law school to invite conversation. For instance, in Contracts, cases dealing with homebuying or employment relationships often allowed my non-millennial law students who own property or have had working experiences to engage in the material from a more practical way and offer insight. Non-millennial law students often prepare differently for classes than younger law students. One very observable characteristic between my millennial and non-millennial law students has been in their method of preparation. Whereas my millennial law students will often find something in their case reading is relevant only because it’s relatable at the time to a concept that we were readily and simultaneously learning in the course, my non-millennial law students will try to broaden what is relevant and significant by asking themselves, “Do I need to know this just in case?” This difference translates into their preparation for my classes and final examination. While I have to sustain relevancy for my millennial law students, I have to show my non-millennial law students what material or information might be extraneous. Some non-millennial law students tend to become important emotional pillars in the student body. Because of their life and career experiences prior to law school, my non-millennial law students often become role models in extra-curricular positions or become sources of emotional support to their millennial counterparts in the first year. This occurrence often does put added stress to their own studies and time management. As the professor, I often will remind my non-millennial law students to take a moment and assess what they can or cannot take on—especially for those students who might also have an active family life or work responsibilities outside of law school. Non-millennial law students learn just as quickly and as readily as millennials. I have no quantitative or qualitative statistics here. This observation is just anecdotal. However, I have witnessed the successes of many non-millennial students in my various classes, which gives me confidence in making this statement. I do concede that success could be attributed to the amount or type of preparation that non-millennial students put forth rather than natural ability. But I stand by this assertion, nonetheless. It is an observation that counters biases against any societal perceptions of “handicaps” to learning as an older law student. Non-millennial law students bring a contextualized experience to the dialogue of the classroom. Often, this observation is touted as a reason to welcome the admission of older law students in law student body. It adds to the diversity of the student population and can be seen as generating different viewpoints in class dialogue. That is true to some extent. However, I have noticed that sometimes the prior work, life, or industry experiences outside of law school can also impair ways to see the other side of a situation—especially if they have had some extensive work experience in something related to my course. So I often will spend time in the classroom welcoming their viewpoints but also de-contextualizing them by countering with hypotheticals that might get them to see other possible sides of an issue. These points above are generalized observations and not all non-millennial law students exhibit these traits. However, I hope my descriptive observations here give some guidance and food for thought to other law teachers out there who are interested in making sure non-millennial law students succeed just as well as their millennial peers. An ABA Business Law Section task force recently completed a landmark report titled “Defining Key Competencies for Business Lawyers” that was published in 2017 in The Business Lawyer (Winter 2016/2017). The report drew on the framework of the ABA MacCrate Report (“Legal Education and Professional Development–An Educational Continuum”), and is directed toward law schools and law firms. Both reports emphasize the importance of negotiation as a key lawyering skill. As the MacCrate report notes, “the skill of negotiation is a fundamental part of legal practice….” The reports also discusses the analytical skills that lawyers must have when participating in negotiations. The MacCrate report, for example, emphasizes that all lawyers must be able to (1) determine the bottom line; (2) evaluate alternatives; (3) identify outcomes from the negotiation; (4) analyze whether the negotiation is zero-sum, non-zero-sum, or a mixture of the two; and (5) examine the negotiation from the perspective of the other side. The exercise, titled “The House on Elm Street,” involves a transaction that everyone can relate to—the sale of a house. The twist in the exercise is that, unknown to the seller, the buyer is a secret agent representing a company that wants to demolish the house. Students receive a short (two-page) role as either the buyer or seller, and they negotiate for 30 minutes, followed by an instructor-led debriefing. The Teaching Note is divided into three sections. Section I explains how to set up the negotiation exercise. Section II provides a script, with slides, for debriefing the exercise. Section III discusses a document titled “Self-Assessment and Feedback for the Other Side” that is appended to the Teaching Note. Students can use this document to evaluate their negotiation skills and develop a plan for skill improvement. In law school courses where legal skills are taught within a legal writing course, the evaluation and plan could be used as a writing assignment. I have used this exercise in degree courses and in executive seminars in North America, South America, Asia and Europe. In addition to law students, attorneys and judges, other participants in the courses and seminars include athletic directors, engineers, entrepreneurs, managers, and physicians. 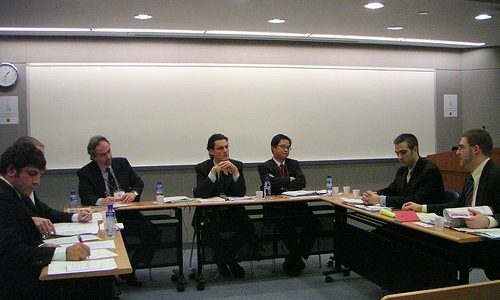 Organizations in the public sector (for example, the World Bank) and private sector (one of the five largest U.S. companies) have used the exercise for negotiation training led by in-house staff. Feedback on the exercise has been positive. Here is a comment on the debriefing experience and the plan for improving negotiation skills. What a great learning experience! [T]he ability to get feedback and actually debrief a negotiation is really powerful! I considered myself rather self-actualized, but some interesting things came to light in the class discussions. I know that if I make a concerted effort to work on [my plan for skill improvement] it will certainly serve me well in my career—both now and in the future. I have also received considerable feedback regarding the impact of the learning from the exercise. Here is a comment from a participant who used a planning checklist based on skills covered in the exercise. I received a quote from a key supplier a few weeks back that was very good and I was just going to accept it as is. [But first I decided to complete the] planning checklist and called in the supplier. We had a great meeting, expanded the pie, learned tons about what each other wanted. In the end we renegotiated everything, set up yearly pricing reductions and a 2 tier pricing schedule that allows me to cover depreciation expenses on any expansion and provides my supplier the long term commitment from me he wanted. Win-Win. The projected savings over the next 5 years is over $4M …. If you decide to use the exercise, I would appreciate your comments and recommendations for improvement of the materials. Thank you. George J. Siedel is the Thurnau Professor of Business Law and the Williamson Professor of Business Administration at the University of Michigan. He can be contacted at gsiedel@umich.edu.